Scott Chandler: The Most Important Football Player. 1. Mega Previews for the New England-Buffalo, Detroit-Minnesota, and Green Bay-Chicago football games. 2. An Interesting Fact™ regarding the Jay Cutler Sack Problem™. 3. 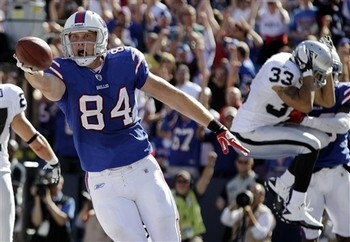 Unflinching -- and mostly unwarranted -- devotion to Bills tight end Scott Chandler. • In the event that you're curious about which receiver leads the 2-0 Bills in Expected Points Added (EPA), please be curious no longer -- because the answer is "tight end Scott Chandler." • A couple other categories in which Scott Chandler leads the Buffalo receiving corps are EPA/P (1.12) and yards per target (8.8) -- i.e. pretty important things. • All of which is to say: get Scott Chandler the ball, Buffalo Bills. • A second note to the Buffalo Bills: try not to get Patriot quarterback Tom Brady the ball. • Because he's the best at throwing it to his teammates, is why. • Through two games, the Lions have one of the most efficient passing games in the league (8.6 net yards per pass), while the Vikings have one of the least efficient (5.4). • Meanwhile, the Lions have one of the least efficient running games (3.3 yards per rush); the Vikings, one of the most efficient (5.8). • Through their first two games, the Lions have scored the second-most points in the league (75) and are fourth in EPA on offense (35.2). • Through their first two games, the Vikings have scored the 26th-most points in the league (37) and have posted an almost exactly average EPA of 7.5. • This isn't conclusive evidence that a good passing game is better than a good running game, but it's also entirely unsurprising. • One theory regarding The Jay Cutler Sack Problem -- one that the author heard sporting-media-ist Michael Wilbon proposing recently -- is that, because Mike Martz's offense has a number of deep patterns, it might make his quarterbacks more vulnerable to the pass rush. • Speaking anecdotally, Martz's offense does seem to favor long-ish routes. • Looking at the numbers, however, we find that only 21.8% of Cutler's pass attempts (sacks excluded) last season were of 15 yards or greater -- tying him for 15th among qualifiers. • This season, that number is even lower: Cutler's thrown under 12% of his passes deep -- ranking him 28th out of 32 qualified QBs. • And still his 11 sacks is the most in the NFL, the Bears' 12.5% sack rate second only to Seattle's 13.2%. The Four Factors you see for each game represent each team's performance in four important categories (pass efficiency, pass efficiency allowed, run success rate, and defensive run success rate) relative to league average (where 100 is league average and anything above is good). Along with the Four Factors, you'll see two other headings: Generic Win Probability (GWP) and Game Probability (PROB). The GWP is the probability a team would beat the league average team at a neutral site. Final GWPs from 2010 for all teams here. The PROB is each respective team's chance of winning this particular contest. Your host, Brian Burke, provides PROBs to the New York Times each week starting in Week Five. Those numbers from 2010 (along with methodology) can be found here. The above games have been chosen as they'll be available to the greatest portion of the network-watching audience, per the NFL maps at the506.com. "is that, because Mike Martz's offense has a number of deep patterns, it might"
But this just looks at where he ended up throwing the ball. His first or second looks could still be downfield, while he ends up checking down to Forte or an underneath receiver if they can't get open. @James: Ack. Here we are: "it might make his quarterbacks more vulnerable to the pass rush." @Anon: I don't deny it: that COULD be happening. Given what information we have, though -- i.e. that almost EVERY quarterback is attempting deeper passes than Cutler -- it's UNLIKELY that that's what's happening. Here are some interesting #s on Cutler. His deep% has been rock solid steady through his career on both DEN and CHI. I was expecting to see a dramatic increase in his sack rate when he went to CHI. But that's not the real story. He's been a sack victim his entire career, except for his one breakout year in '08. So, I just saw Moneyball. My prediction: someone is going to start paying a lot of attention to what you guys are doing here. I don't know if any coaches or owners have contacted you, but after seeing the movie and seeing what you guys are doing, I literally had a revelation and realized that the way I looked at statistics in football was completely backwards. Of course the denominator is just as important as the numerator, and yet years of conditioning by commentators has blinded me to that fact. Could you, for example, put together a roster of the most undervalued/underrated players in football? I'd love to see an analysis like that, if you've got the time. I could have sworn I posted a comment here.